BugMe from Electronic Pocket is a note and a reminder taking app for the iPhone and iPod touch that uses simple stickies and finger drawn text to create reminders that you can view on a virtual cork bulletin board. BugMe also lets you setup push notification for each note as reminders, and export each sticky as a HomeScreen icon for even more in your face reminding action. BugMe Ink Notes and Reminders for the iPhone has already built a stellar reputation on old school handhelds such as the Palm OS and BlackBerry and is now available for Android and iPhone, iPod touch, iPad. Using the BugMe app couldn’t be easier more more straightforward. Just tap on the Post-it like stickers to create a new note. You can change the brush color and brush size to customize your note by tapping on the color palette icon. You can swap marker colors between black, purple, blue, green, red, orange, yellow, and white each with either narrow or thick writing tips. 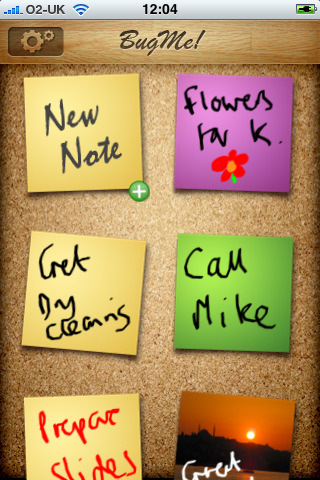 Tapping on the stickies icon allows you to change the paper color form the default yellow to pink, green or blue. What’s great about the notes in BugMe is the ability to write notes on pictures to save as reminders. To do this just start a new BugMe note and tap on the stickies icon and choose either an existing photo or use the iPhone camera to take a picture of something, and use that as your writing canvas. This is a clever feature that can be used in creative ways to come up with unique looking reminders. For example, instead of a notepad that reads pay bills, you can snap a picture of your bill and write “Pay” next to the amount due area. The last two features of the BugMe app are Home Screen icon creation and push notifications. You can export individual messages as icons that you can place on your iPhone. Tap the paper airplane icon and choose save to Home Screen. BugMe will send your note to their servers, then launch Safari so you can save the note as an icon. The developers state that the note is deleted from the ir server once this process completes. You can also e-mail a screenshot of the note to anyone, post it to twitter, or save the note to your photo album. Alarms are a great way to have sounds and push notifications sent to you for your notes. Creating alarms are super easy. Just pick a prefilled time and you’re done. The options include “top of the hour”, “five minutes”, “10 minutes”, “15 minutes”, “20 minutes”, “30 minutes”, “one hour”, “tomorrow morning”, “tomorrow”, “next week”, and “custom time”. As always remember that push notifications require network connectivity and will not work if you’re disconnected or have an iPod touch. Settings provide the ability to pick the alarm alert sound from a set of nine audio files including discrete, techno, bills, finger, on the hour, shards, clatter, warp speed, and alarm clock beeps. Here you can also enter your twitter account information and change the default paper style color. BugMe notes can be re-arrangded on the screen by tapping and dragging to a new position, or just shake your iPhone to sort with most recent alarms on top. Shake also works as undo while writing with the brush. It would be great if the size of the note icons could be adjusted to fit more of them on the app’s screen. It would also be nice to have the ability to view all your notes in a list format and export notes with reminders as calendar events. If you like creating hand-drawn notes BugMe is the wonderful solution for quick reminders on the iPhone, and at $0.99 it’s a great utility for taking some of the pain out of having to remember your todos. AppSafari review of BugMe Ink Notes and Reminders was written by Joe Seifi on March 21st, 2010 and categorized under App Store, Calendar, Featured, Notes, Productivity, Reference. Page viewed 6121 times, 1 so far today. Need help on using these apps? Please read the Help Page.